We have settled well in St.Petersburg. And we all love being here. It is a smaller city compared to Moscow. People are very nice, and I am not used to this. The life here is not so fast. 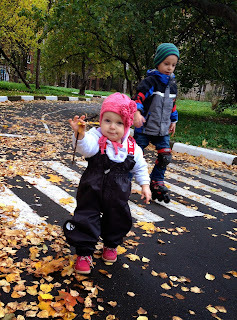 We have switched into a homeschool mode and this helps to have a slower lifestyle too. 6 days I help my 12 year old and 7,5 year old sons with school. My youngest son learns reading and enjoys filling in study books and playing a lot with lego. I see a great reward in the fact that we're not separated during the day. The boys have to work through the conflicts during the day. Our mornings are free of rushing, we have breakfast and read the Bible before we start a school day. I am blessed here with new friends. This month we started a women's group in our home. We use Denise Glenn's MotherWise materials. I like the words of wisdom in Sally Clarkson's book The Mission of motherhood. She said that not many people take initiative to open their home, but she is willing to do the work (cleaning, cooking, preparing the material) and enjoy fellowship, than do nothing and be alone. So am I. While my mother-in-law was visiting and catching up with all the new things her grandchildren are learning,(our youngest child, Sofia, is 13 months already), I was able to find a bit of time to craft. I challenged myself to use the scraps and the cut out flowers I already have. The beautiful stamp is called Night Flower (Hero Arts). And I had a sheet of printed out Bible verses. As I missed having any meaningful new sentiments I thought I'd better use up the printed sheet of the Scriptures I already had on hand. The white embossed flower has two layers and is popped up for dimension. The little tag has been in my scraps for ages and I am so happy to find a cute little home for it. 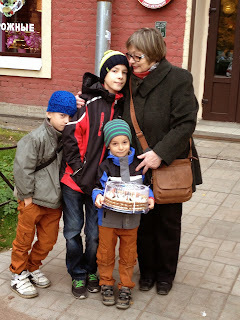 Almost all the cards were given to my mother-in-law to say "hello" to our relatives in Smolensk. The sentiment in Russian says "May the God of hope fill you with all joy and peace as you trust in him..." (Romans 15:13). The colors work so beautifully together! The panel was made with distress inks and water, Large Blossom and Big Post Card (Hero Art). Thank you for visiting! Have a great week-end! 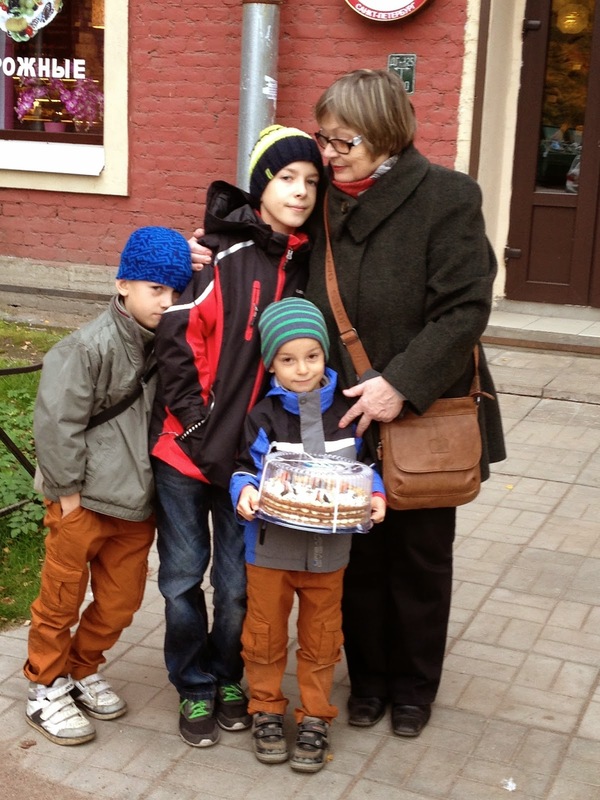 Hello Maria, lovely to hear you have settled down and are enjoying your new life in St. Peterberg! I have opened my house too to hold a woman's group every week with five women. Just last week I used the leaves you sent to me, do you remember - they were orange and red fall leaves. I prepared five cards, each with patterned paper, a doily and a leaf which were then glued by each lady to make the card. I then told them to write a letter in it to their husband and surprise him. It could be an encouragement, a love letter or whatever. My daughter in law said that it came just at the right time for her! Now I am praying for a theme for next week. I have been very tired lately - a lot of things happening. Michaël has flown the nest too, he got married in September so a new period in our lives to be just René and I at home. The Lord is stretching our faith too and I know He wants me to find more Joy and Peace in Him. Bless you, Maria - you are a pearl in His Hand. 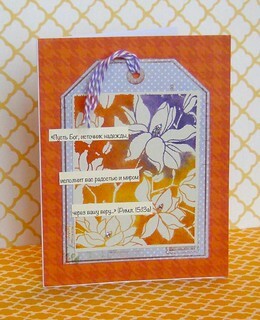 Just wanted to add how much I love your cards, the beautiful colors, the verse and the fact you used your scraps! Your daughter is growing so quickly too! Thank you, dear Jacqueline, for your words of encouragement. This is such a nice and thoughtful idea to make card kits for the ladies. 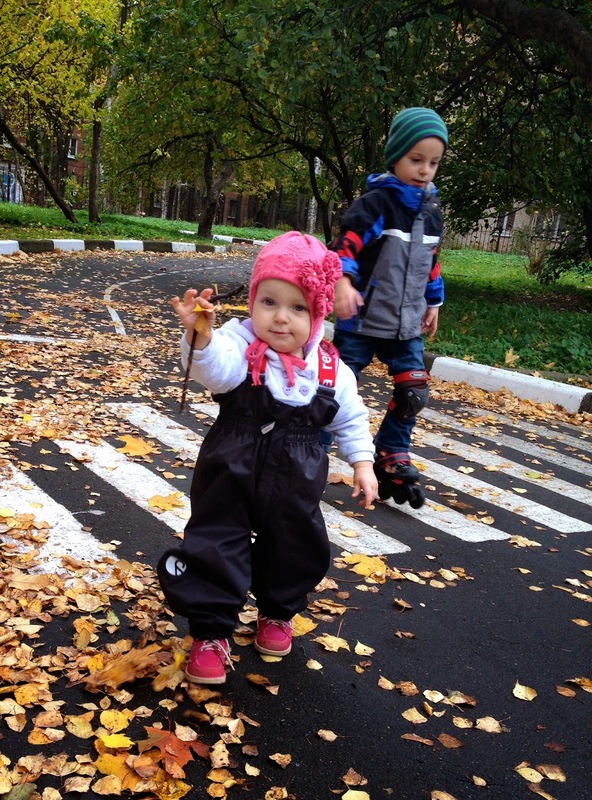 May you enjoy a new season in your life!